Beth MacKintosh – ‘Josephine Tey’ to mystery fans – was born in Inverness in 1896 and died in 1952. The Daughter of Time, her fictionalised enquiry into the life of Richard III, was voted best crime novel by the Crime Writers’ Association in 1990, and many of her other titles are regarded as solid classics. My favourite, The Franchise Affair, is based on a true story, the 1753 case of Elizabeth Canning, a maidservant who falsely claimed to have been abducted and held prisoner in a hayloft. Brat Farrar is the story of a sympathetic impostor, set in an English stables. As good as her crime-writing was, she was arguably more known for her theatre work. As ‘Gordon Daviot’ she had plays staged in the West End and on Broadway, and even wrote for Hollywood. Despite her fame, she remained modest and avoided the limelight, preferring to remain living in Inverness in the Scottish Highlands, meaning she is probably the most mysterious of mystery writers. My copy of The Franchise Affair. The copy in the British Library lacks the pink wash, for some reason. If you Google Josephine Tey, the first result is ‘a very private person.’ How did you go about finding out about her life? I tracked down letters from Tey, her family and friends, official records, contemporary newspaper reports, and Tey’s original manuscripts. I spoke to academics, crime fiction fans and people who knew Tey personally. Tey’s family were very generous in letting me look at family papers and photographs – and they even had some of Tey’s unpublished writing. You can imagine my excitement at reading ‘new’ Tey stories! When I told other mystery fans I was interviewing you, the number one question was: what do you make of Nicola Upson’s Josephine Tey series? Has she got her right, in your opinion? I spoke to Nicola and to many other people as part of my research. I wanted to find out about the real Tey – or Beth MacKintosh as she really was. The more I found out about Tey’s life the more I admired her. Tey has entertained and inspired many people, but Nicola’s books are fictional of course – her character ‘Josephine Tey’ is not the same as the real Beth MacKintosh. Brat Farrar is one of my favourite Josephine Tey books. I find the beginning so fresh every time I re-read it. Beth wrote to one of her friends about the creation of the characters, so I was able to find out a lot of detail about how she went about writing this book. It’s true that Beth spent most of her life in Inverness, but she lived and worked in England in her teens and twenties, and this time was very important to her. Her two sisters both lived down south as well, as did many of her friends, who she visited when she could. And Beth was a big fan of horse-racing – though she never actually placed a bet. Where did her various names come from – Josephine Tey and Gordon Daviot? Both of her pen-names were very meaningful for her. Daviot is the name of the place where she spent happy childhood summer holidays, and Josephine was her mother’s name. The split between ‘Josephine Tey’ and ‘Gordon Daviot’ is a bit of an artificial one. She used both names throughout her career and there’s a lot of overlap between the types of work published under each name. “The Man in the Queue” appeared first under the Daviot name, for example, and she published novels as Daviot as well as plays. There were different reasons why she chose to use different names at various points in her writing career, sometimes connected with trying something new, sometimes more to do with publishing and marketing demands. Do you think she liked being Tey or Daviot more? Being a playwright or a novelist? At one point in her life she said she liked playwriting better than anything – but later on she said she found writing mystery novels the most satisfying. The theatre and literary worlds changed a lot in her lifetime, and the experience of writing and publishing changed as well. I think she just enjoyed all writing, and she experimented with several different forms. One thing I’ve tried to show in my biography is the range of her writing, which is much greater than people realise. She didn’t just write crime fiction and theatre plays, but also literary fiction, short stories, poems, biography, radio plays – and she even wrote for Hollywood. She also used a third pen-name, which she managed to keep totally secret during her lifetime and which is still not widely known. The story behind her third pen-name is a very interesting part of her writing life. Gallery | This entry was posted in Golden Age detection, Information Received, Non-fiction, Non-fiction and tagged Beth MacKintosh, Gordon Daviot, Jennifer Morag Henderson, Josephine Tey. Bookmark the permalink. The Upson novels, good as they are, do annoy me in the “re-writing history” sense. If it’s a fictionalized Tey (and not just in her crime-solving exploits), why not call her something else? 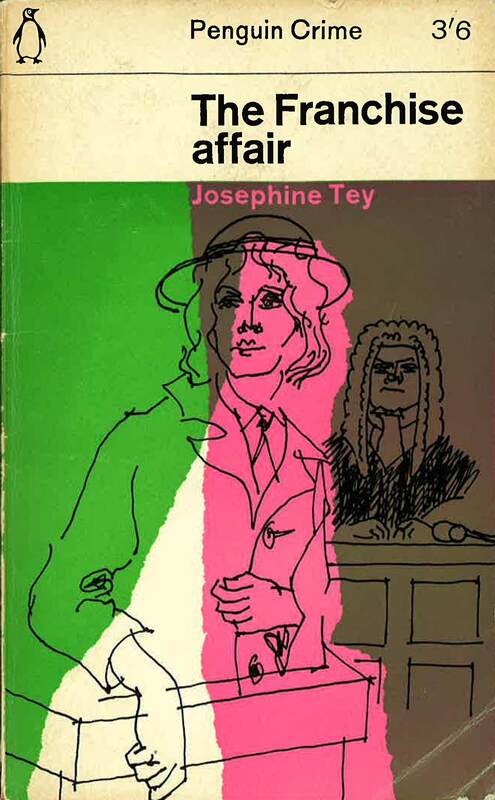 I have yet to read any Josephine Tey but do have 3 somewhere in my tbr including an exact replica of the old penguin pictured above of the Franchise Affair. A long time since I read Tey – this prompt me to revisit – and look out for the biog, thanks. Thanks for posing my question – very satisfying answer. I’ll certainly be looking out for the biography, this has very much piqued my interest.